Bowling Green is in the Top 10 this week. The Falcons were seventh in the U.S. College Hockey Online Top 20 and eighth in the USA Today/USA Hockey Magazine Top 15. The latest polls were announced Monday afternoon. BG posted a 3-0 victory and a 4-4 tie against the University of Alaska (Fairbanks) last weekend. The Falcons are 13-3-4 overall and 9-1-2 in the Western Collegiate Hockey Association. They’re 6-0-3 in their last nine games, the longest active unbeaten streak in the country. In the USCHO poll, the Falcons received 642 points, up from 452 last week when they were 11th. BG debuted in the USCHO poll Nov. 10 and moved up for five straight weeks before remaining at No. 13 in the Dec. 15 rankings. “It’s been a lot of hard work during the last 4½ years,” said BG coach Chris Bergeron, who is in his fifth season. “It’s meant a lot of sacrifice by the players, for themselves, for each other and for the program. In the USA Today poll, the Falcons totaled 249 points, compared to 105 a week ago when they were 14th. The Falcons face a big series this weekend when they travel to Houghton, Mich. to take on 11th-ranked Michigan Tech. BG is third in the league with 20 points, just one behind Tech and six behind first-place and top-ranked Minnesota State. The Falcons, however, have played two fewer games than Tech and four fewer games than Minnesota State. Minnesota State has the best winning percentage (.844, 13-2-1) in league play in the WCHA, followed by BG (.833) and Tech (.750, 10-3-1). 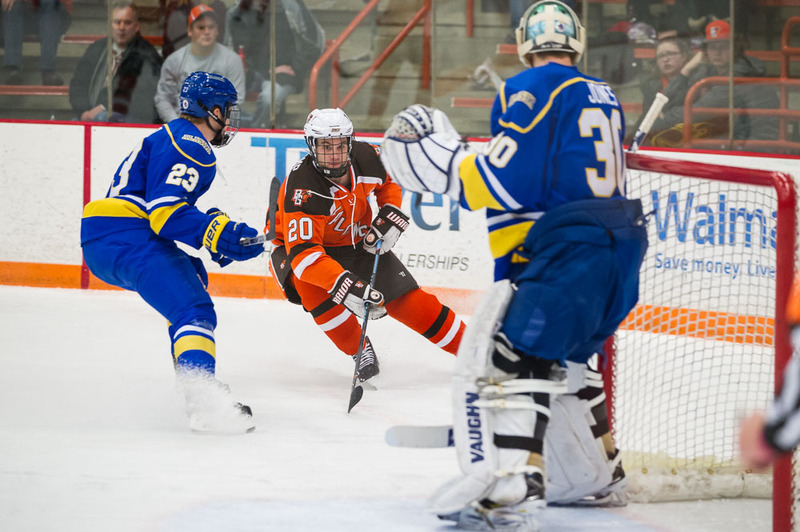 This weekend’s series marks the first meeting between BG and Tech since the Falcons swept the Huskies in the Ice Arena in the first round of the WCHA playoffs last season. Faceoff is 7:07 Friday night and 5:07 Saturday night. Although BGSU’s records are still being researched, it is believed the Falcons are in the Top 10 for the first time 1990-91 season. 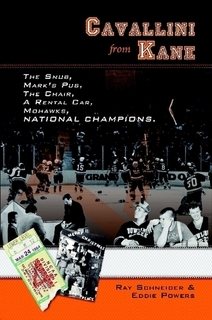 The USCHO poll started in 1997. PAIRWISE: After tying Alaska Saturday, the Falcons dropped one spot to fifth in the Pairwise Rankings, which mirror the selection criteria for the NCAA playoffs. Minnesota State is first in the Pairwise, while Tech is 14th. The NCAAs consist of 16 teams, six automatic berths and 10 at-large berths. Being fifth in the Pairwise would earn the Falcons a No. 2 seed for the NCAAs. The NCAAs consist of four, four-team regionals for single-elimination games. The Falcons haven’t played in the NCAAs since 1990. NELL: BG freshman goalie Chris Nell ranks third nationally in both goals-against average (1.41) and save percentage (.950). He’s third in the league in both. Nell is the only unbeaten goalie in the country with a 6-0-1 record in seven games. PK: The Falcon penalty-killing leads the nation at 93.7 percent (74 of 79). Vermont is second at 93.6 percent, while Merrimack is third at 91.5. The Falcons were 8 of 8 against Alaska. They haven’t allowed a power-play goal in five straight games, and in 10 of their last 11 games. BG has given up just one power-play goal in that span, Dec. 5 at Northern Michigan. The Falcon penalty-killers are 43 of 44 in their last 11 games, and have killed off their last 23 short-handed situations.